It is an act of normalization. On Nov. 8, 2016, Donald Trump, who ran and won on a xenophobic, racist platform, was elected to the highest office of the United States. His win was “unpresidented” for a number of reasons, among them his complete and utter lack of political experience, and his galvanization of the all white “alt right” who think the right way to be is white. He bragged about sexual assault. A civil pretrial date was set for Dec. 16 (in an ongoing and murky saga) due to allegations of sexual assault against a minor. In an open display of ableism, Trump mocked and imitated a journalist with arthrogryposis. And somehow, none of these things, individually or collectively, stopped Trump from being elected, ergo, these things will not stop Donald J. Trump from being inaugurated on Jan. 20. Trump is the next president of the United States of America (that is still the oddest thing to wrap my brain around, let alone write out and have it be true), and even though many marginalized people feel fear and apprehension at the dubious future of our human and civil rights, many are picking themselves up, dusting themselves off, planning, organizing and preparing their resistance. There are people getting intrauterine devices as birth control while they still have health coverage, because IUDs last for ten years. Others are dedicated to stockpiling birth control in case health coverage is revoked or the availability of birth control wanes. And still others are flocking to marry, lest the legality of their relationship be called into question, or the ability to legalize their relationship no longer be an option. Actions, be they large or small, are necessary for people to protect themselves and others who are more vulnerable than they. In this country we elect representatives to serve our interests, and we put our heroes – who we think are the best forms of ourselves – on a platform. Unless our heroes and representatives are openly racist, xenophobic, ableist, and sexist, should not all the leaders and people who have ever claimed that #BlackLivesMatter or Muslims are guaranteed freedom of religion like everyone else, or that LGBTQIA folks have a right to exist, be openly protesting Donald Trump? Post-election rhetoric often has people telling Trump supporters that their vote cast for a racist, sexist, ableist xenophobe means they are those same things by willing association and support. So why then, is anyone who has employed that rhetoric now using it to defend the people choosing to attend Donald Trump’s inauguration? News recently broke that Laura and George W. Bush, Hillary and Bill Clinton, and Jimmy and Rosalynn Carter will be attending the inauguration of Donald Trump, someone who wants to make a registry for Muslim people, despite the Freedom of Religion portion of the First Amendment and what happened to Jewish people during World War Two. Though all of them are quite notable, very relevant among these names is Hillary Clinton, as she has just lost the presidential election. While on the campaign trail, many reported that Clinton was struggling to gain the votes of people of color. She hosted sitdowns and meetings with activists though, and eventually racial and social justice became a part of her campaign. She will still attend the inauguration of someone who said Mexican immigrants in America are largely rapists and criminals. And as people tend to do, they are defending her on this decision. As someone who falls into more than one marginalized category, the election of Donald Trump, who refers to people like me as “the blacks,” is something that I have taken personally. Additionally, every leader, just like every citizen, who does not denounce him in both word and deed is complicit. That we can describe the handing of the reins from our first black president – who, regardless of his politics, was historic for the United States – to someone who was literally endorsed by the Ku Klux Klan as “a peaceful transition of power” is the epitome of insulting. There is nothing peaceful about white supremacy, also called “white nationalism,” and the “alt-right” movement. These things, throughout history, have violently opposed non-Christians, brown people, and LGBT people. That is a fact. 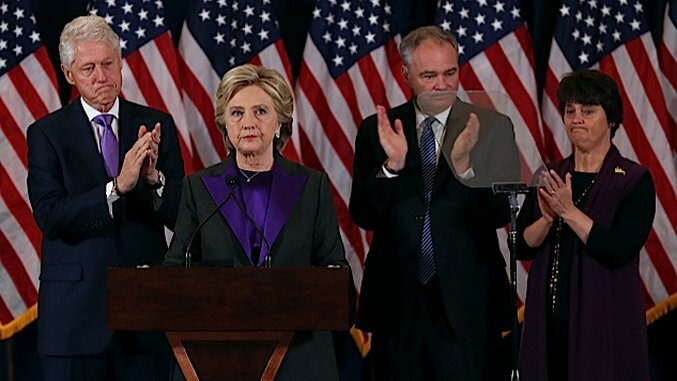 I have seen far too many people defending Hillary Clinton attending the inaugration with excuses like she must go because of tradition and propriety, that the media will skewer her if she does not attend, even while saying in their previous breath that we cannot normalize a Trump presidency. Showing up for Trump’s inauguration out of a sense of obligation (while not resisting) is normalization. Treating this as anything other than unprecedented is normalizing this. Having so many people in the cabinet who either oppose the purpose of the post they have been given and/or have close ties to white nationalism is not normal. Having a president that wants to run the country like a business or a reality show is not normal. Laws that take away the rights of Muslims or gay people or trans people or reproductive rights are part of an America we claim to have moved away from. Martin Luther King Jr. was arrested, beaten, tracked by the United States government. He was called a race baiter and a troublemaker. President Obama needed only to say the word “black” for folks to say he is the most racist president we’ve ever had (and we have had presidents that have literally owned slaves!). I know no one wants to think of themselves as mice, but because of systems of power, as well as present and historical oppression, many of us are. And I, personally, would like our leaders and our country to give me some help with my tail.